Our artisans have created a very special purse gift basket that is sure to delight any tea lover. Each Tea Gift baskets are loving hand crafted starting with a beautiful Spring Golden Purse themed Gift Basket which included a selection of handpicked premium teas including: English Breakfast, Lemon and Raspberry, Highland Select, Apricot Medley, Blueberry, Peach and EnliTeaments English. To accompany the world class teas a assortment of biscotties. This Basket is Designed for gift giving. This Tea Purse Basket is lovingly hand crafted with attention to detail, bow tied in ribbon and ready for gift giving, gift basket is pre-arranged so it is ready for gift giving. Each Tea Basket is sized to "WOW" with measurement of 9x9x4. 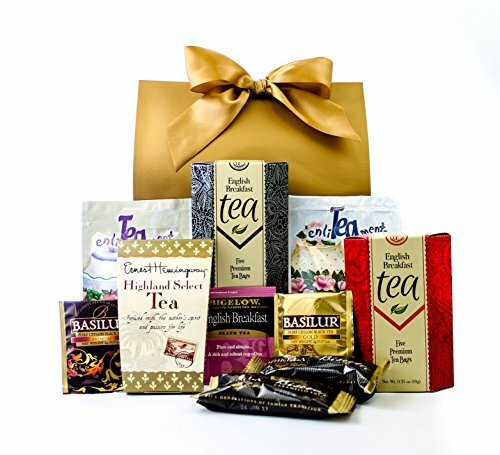 Perfect for any occasion for the tea lover in your life - Mother's Day, Birthdays, Teacher Appeciation or any special day. To include a personalized gift message or to notify your recipient who purchased this thoughtful gift, you must select gift during checkout, allowing you to input your own personalized best wishes. This is an original gift basket arrangement designed by Gifts Unlimited. Each purse basket is lovingly hand crafted with attention to detail and ready for gift giving This Gift Purse is prearranged so it is ready for gifting, No need to re-arrange the gift. If you have any questions about this product by Gifts Unlimited, contact us by completing and submitting the form below. If you are looking for a specif part number, please include it with your message.